MailOrderWorks is a Windows based program that connects securely to our a high speed, high availability database servers. This approach allows you to share business information with your team in real time, and lets all your staff connect to the same system simultaneously even if they are working from different locations. Because we provide a hosted solution, you don't need to invest in your own server hardware or worry about managing it. All you need to do is ensure each computer you wish to use has access to the internet, preferably via Broadband. 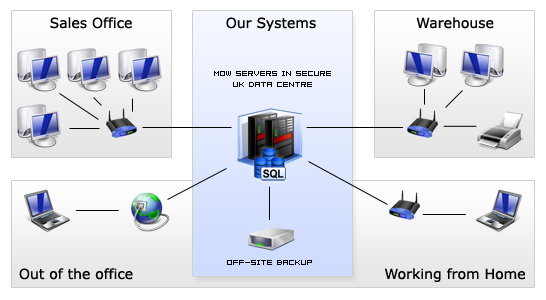 For stable and high speed connectivity we run our servers from a secure UK data centre. We're connected to many of the leading transit providers, resulting in a very reliable connection - essential for a system such as MailOrderWorks. Our commitment to this can be reviewed in our Service Level Agreement (SLA) for MailOrderWorks data hosting. The other great advantage is that if you have a serious computer problem, your data is safe. Our database servers run Linux and are dedicated to running databases - minimising the risk of viruses and other problems causing harm to your data. matter if your team are all in the same building or dotted around the country. Many MailOrderWorks software users choose the system because their staff often work from home and need access out of hours. A MailOrderWorks company account includes one user connection - that connection "slot" can be used at different times by multiple computers by the same person (eg: office PC and laptop by the same licensed user). You can easily add more users (and thus connections) to your account, allowing more staff to be connected at once. See also: system features and system screen shots.